Tie Dye, Ice Cream & T-Shirts !! 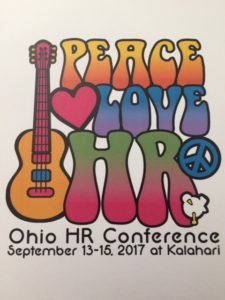 This past week I was in my element more than usual because I attended the Ohio SHRM State HR Conference. I was able to be surrounded by my peers as well as a constant vibe of music, tie dye, lava lamps and harmony. Yes, I know that sounds like serious hippie lingo, but I felt right at home. If you haven’t been to State SHRM conferences, you should check them out. They have a more intimate feel to them and you can take time to genuinely connect with people. Yes, they are full of events, excitement and phenomenal sessions of HR content, but they have a more relaxed pace to them. Two speakers completely captured my attention because of their personal story in approaching business. 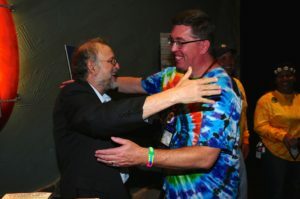 We heard from Jerry Greenfield, co-founder of Ben & Jerry’s and John Jacobs, co-founder of Life is Good. So much of what they had to share really stuck with me both emotionally and logically. In today’s frenetic pace and ever-changing work environment, these two companies have made sure that they ran their enterprises from a values-based perspective. These aren’t the “values” that corporations dream up during their annual strategic planning exercise. Both companies have deep held beliefs that they will not sway from as humans that shape their culture and their impact throughout the world. It was so reassuring to see this, but this approach is rarely followed. The “value” that is espoused and held to more than any other today is profit. I understand, and agree, that companies need to be profitable in order to survive. I get the economics of it. However, if there isn’t a higher calling to having an organization, it can’t sustain itself. It’s great to see more and more small businesses and those making up the Gig Economy are changing the rules of work. It’s also reassuring the businesses are finally starting to realize that they are nothing without their people. Please note that this has ALWAYS been the case, but we’ve spent centuries trying to prove it out as something else. There are still holdouts that will contend that structure, processes and systems are the real backbone of successful companies. Those elements are needed, but they mean nothing without people. Both Jerry and John shared stories about humans and how those shaped who they were and how they were able to succeed. They stuck to their unconventional approach while holding to the beliefs that (1) social responsibility is an obligation and not a feel good philanthropy effort and (2) optimism always outshines negativity !! I knew I was among my brethren when I met them. Jerry doesn’t shake hands, he hugs. Perfect. John started his session by saying “The best way to kick off a presentation is to throw stuff into the crowd ! !” and he tossed Life is Good frisbees into the masses. He also closed his speech by having a group of attendees join him on stage to play Beatles tunes on kazoo while the rest of us sang along !! Being genuine in business shouldn’t be an exception. It should be the norm. I’m thankful for the reminder and will remember to practice this every day on purpose ! !